In addition to the population-related pressures of housing affordability and congestion, Australia is experiencing an ageing population and uneven distributions of people movements around the country. State and federal governments are talking about policies to redistribute people away from rapidly growing places like Sydney and Melbourne towards places experiencing decline or stagnation like South Australia and, until recently, Tasmania. Despite recent announcements of a redistribution strategy to ease big city congestion, without a comprehensive population policy much of the political rhetoric has remained exactly that. Partly there is little understanding, beyond aggregate data, about how people are responding to population changes and deciding to move. What we do know is that people are moving in ways that our current assumptions about internal migration cannot adequately explain. In Tasmania, the reversal of interstate migration trends and the fastest population growth in almost a decade for the year to March 2018 are getting media attention. However, from a national perspective, the high level of migration out of Australia’s two biggest cities to coastal, regional locations suggests something else is at play. Sydney is also receiving considerable media coverage of an increase in actual and planned migration from the city. Of the five substate regions (known as SA4s) in Australia with the highest net internal migration losses, four are in Sydney: the Inner South West, Eastern Suburbs, Paramatta and the Inner West. Housing affordability, traffic and other forms of congestion that affect lifestyle and amenity are often cited as reasons for leaving. While Barnaby Joyce sees migration to places like Tamworth as the solution to crowded cities, it is coastal regions – places like the Gold Coast, the Sunshine Coast and Geelong – that are attracting more Australians than any other area. Tasmania previously had a reputation for attracting retiring baby boomers with greater housing affordability, lower cost of living and the state’s natural and culinary environment for those seeking an active retirement. Yet a brain drain of youth to the opportunities offered by metropolitan cities had counteracted this trend. The “Mona effect” has changed Tasmania. Of course, this is not a unique trend. Researchers internationally have explored the counter-urbanisation movement for many decades. Elsewhere, as with Australia, people have long sought to escape stressful and complicated city lives for simpler ones in rural or coastal places. Internationally, we have seen a rise in so-called lifestyle migration of the middle classes seeking a better way of life. Often they choose non-urban spaces such as rural France and recently climate change “boltholes” for the super rich in places like New Zealand. So who are the recent seachangers in Australia? Using ABS Census of Population and Housing data for 2016, we developed profiles of those who did not live in Tasmania or in the Sunbelt area one year prior. The largest age group moving to Tasmania was those aged 25 to 29 years (14.0% of all movers), followed by those aged 20 to 24 (11.8%) and then 30 to 34 (10.3%). 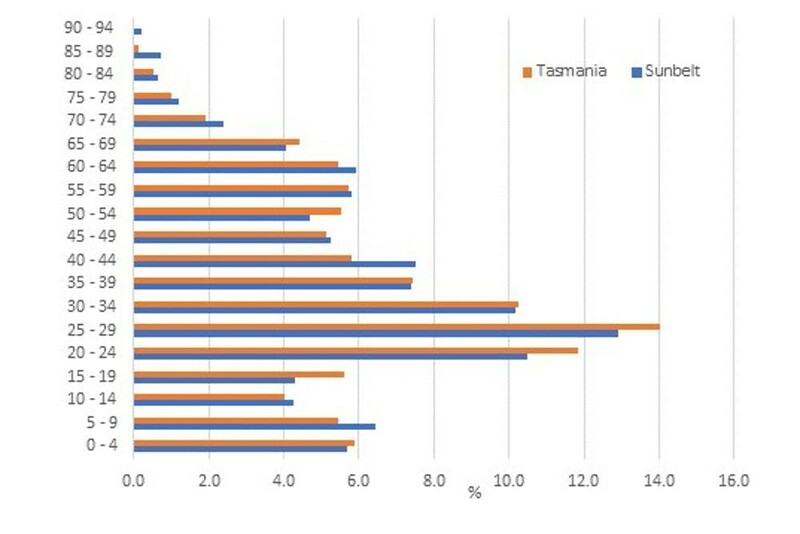 Just like Tasmania, the largest age group moving to the Sunbelt was those aged 25 to 29 (12.9%), followed by those aged 20 to 24 (10.5%) and then 30 to 34 (10.2%). Seachangers’ age structure for Tasmania and the Sunbelt. Author calculation using ABS Census of Population and Housing data. The difference between Tasmania and the Sunbelt is the place of origin of these migrants. Both attract a large proportion from overseas (27.0% and 16.2% respectively). For Tasmania, the next biggest groupings relocate from Greater Melbourne (13.8%) or the rest of Queensland (12.6%). 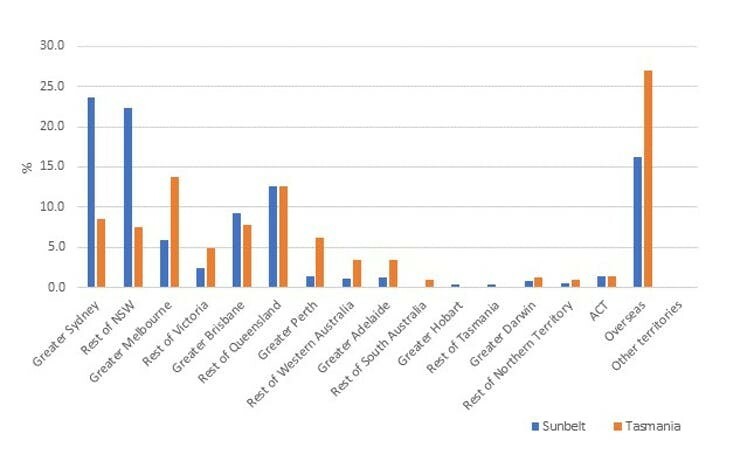 For the Sunbelt, large proportions of recent migrants previously lived in Greater Sydney (23.7%), the rest of New South Wales (22.3%), or the rest of Queensland (12.7%). Seachangers’ place of origin. Author calculations using ABS Census of Population and Housing 2016 data. What’s attracting the new seachangers? The next important question is why are people moving to places that lack resources and employment? In research we have conducted over a decade now, it is clear no one variable dominates. The most important factors often repeated to us involve both economic and aesthetic concerns. These include obvious issues like housing affordability, debt (via mortgage), stress and overwork. Other important concerns include risk perceptions of living in the city, bringing up children in simpler settings, experiencing increased quality time due to shorter commutes, and the imagined peacefulness of living in less populated and more aesthetically pleasing environments. As we shift into a climate-changed environment, we could increasingly see movement for climate reasons. We are mindful that coastal development itself is at odds with this, with houses being built in highly vulnerable areas. Importantly, with the appointment of a federal minister for cities, urban infrastructure and population and continued talk about overcrowded cities and how to alleviate this, we might want to examine those who are already making a seachange. Despite a recent Grattan Institute study finding that the major cities are “coping” and “adapting” and that much of the counter-narratives are overblown, there is too much anecdotal evidence to ignore that, at the very least, coping is not what people aspire to for their living and work environments. Finding a way to include these accounts in the current debate is crucial to our inevitable transformation into a bigger Australia. 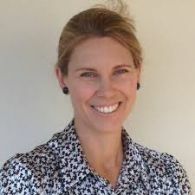 Lisa is a demographer and a Research Fellow with the Institute for the Study of Social Change at the University of Tasmania. Over the past twenty years, Lisa has accumulated a wealth of knowledge and experience in both private industry and the public sector in Tasmania. She has an intricate understanding and knowledge of the influences and drivers of Tasmania’s population and economy and a deep commitment to ensuring that the State’s potential is realised.